The bull run, fuelled by hope, may be over but the stock market can move higher. So stay invested in quality businesses. Even after the BSE Sensex crossed the 25,000 mark, Nilesh Shah, director of Axis Direct, a subsidiary of Axis Bank, is busy buying stocks from the market. "We are in a bull market and I am a buyer even at the current levels," says Shah. He feels that the market is bullish on the hopes that the new government led by Narendra Modi will take steps to bring back growth into the economy. "The direction is there. We will have to wait and watch on the magnitude of this change," he says. IDFC Mutual Fund has a different take. It was cautious about the recent rally in the market. In June first week, the officials of the mutual fund had told its distributors that their fund managers had no hand in generating the impressive return in the market rally following the May 16 election result. However, they also said that how much it can save during the downfall would depend on the experience and skill of their fund managers. This indicates that the recent rally was faster than expected and there is a good chance for correction in the near future. The mutual fund had met distributors as it has re-opened IDFC Premier Equity, its flagship equity fund, for lump sum investment. The BSE Sensex has gained 15 per cent in the last two months. 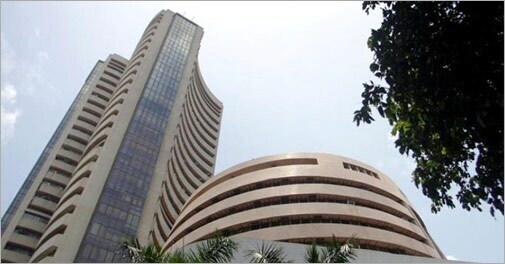 The Sensex jumped to an all-time closing high of 25,580.21 on June 9 from a low of 22,197.51 on April 7, the day when the first phase of polling began. The rise has primarily come after May 8 based on the expectation that the Narendra Modi-led National Democratic Alliance (NDA) will get a clear majority. On May 8, the Sensex was trading at 22,344.04. Year-to-date, the Indian market has gained nearly 22 per cent and ranks among the top four markets in the MSCI Emerging Market Index. India lags behind UAE (44 per cent), Qatar (27 per cent) and Turkey (24 per cent). "The mandate is clear from the people. It is the strongest mandate given to any government in India in the past 25-30 years. It's certainly an opportunity to build a new India," says Christopher Harvey, Managing Director & Global Leader (financial services) at Deloitte who has come to India after two years to meet colleagues, clients and regulators. Despite being positive, he was also cautious and knows well that India will take time to deliver. "Like a 7.5 per cent growth in China, the 4.5 per cent GDP growth is not enough for India. It has to grow much more. It's not going to be easy for the new government as it's not going to be a government with popular policy. India is a super tanker and it takes efforts to turn the tanker and it will take time," he says. Market is not living in the present as fundamentally not much has changed. But market has already taken into consideration that growth is a certainty with Modi coming into power. Market always discounts the future and today it has a strong conviction that India under Modi is expected to be pro-business, pro-growth and pro-reforms and the new government will revive demand and investment. If we compare the market performance between June 2013 and May 2014, the Sensex has gained 23.5 per cent. More than 50 per cent of stocks (1,061 of 1,959) on the BSE have beaten the benchmark and 76 per cent of the stocks (1,481) gave returns of more than one per cent. Most of these gains were in April and May 2014. Compared to this, between June 2012 and May 2013, the BSE Sensex had gained 23 per cent, while the stocks that beat the benchmark were 22 per cent (424 of the 1,959). Only 710 stocks (36 per cent) delivered more than one per cent. FII flows between June 2013 and May 2014 was $12 billion compared to $31 billion between June 2012 and May 2013. This shows that when momentum picks up fundamentals go for a toss. It doesn't matter if the stock is good or bad or ugly, everything moves and it would be better to ride along with the wave but never against it. Though the rise has been sharp, experts don't see the market at euphoric levels. "Market is still at a 20 per cent discount to its previous peak. Today the market (Sensex) is trading 16 to 17 times forward compared to the 25 times forward in 2008," says Shah of Axis Capital who still sees valuations fairly valued at current levels. "Since the previous peak of 2008, Sensex has jumped 20 per cent, while earning has grown 100 per cent and therefore the rise isn't unwarranted," he says. According to Mahesh Patil, co-CIO at Birla Sunlife Mutual Fund, in the last two to three years valuations were being looked from a one-year perspective. "If you take that view, then markets look expensive. Now that the new government is stable, the market is valuing for a longer time like three to five years. So even though there is no change on the ground scenario, there are expectations. Also we are hitting the bottom of the economic cycle, so barring any black swan from the international markets, we are witnessing a start of the investment cycle," he says. Stocks are catching up with the fundamentals, but the rally of hope is clearly over as one can't invest in anything. Despite the favourable statistic showing that the probability of going wrong is lower than a year ago, going ahead won't be a one-way street. "The market will go up and down. Though everything has run up, it's not going to be the same going ahead. Don't buy cheap, buy quality business," says Shah. India is also in a unique position as among its peers there is no other market that is so attractive. Among the BRIC nations, investors aren't willing to take a call on Russia due to the Ukraine tension, China due to growth and credit slowdown and Brazil due to micro-economic issues and internal strife. Similarly, investors are wary of Thailand, Egypt and Turkey due to political tension. 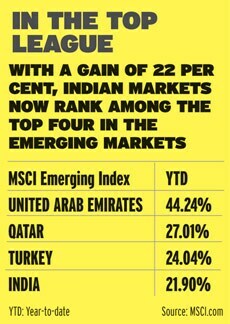 Another positive for the Indian market is local funds are likely to be back. "Expectations are that local money will flow. However, so far we haven't seen them coming into the market," says Patil who says the current rally is fuelled by global exchange-traded funds and hedge fund money. Also, there has been a slowdown in redemption of unit-linked insurance plans after the industry regulator, in 2010, increased the lock-in period to five years from three years previously. "Some global hedge funds have become active and they have shown interest in the Indian market," says Patil who feels that the global funds are still to come and that would further boost the Sensex. Though India looks positive, it's also getting costlier among its peers. Russia, Brazil and China for instance are already trading at 60 to 65 per cent, 50 per cent and 40 per cent discount, respectively, to India, which is also costlier than the US. "Yes, the global risk-off will be a negative for our market. But for now there are no fears of outflows.However if the flows shift, it can be painful for India," says Patil. He sees decent opportunity in the market but is clearly not in favour of playing blind. "There was value in the market. The decisive government kicked the initial rally, which is now over. Henceforth one has to be careful in picking stocks and from here on earning growth will drive stocks." After a sharp rally, the bull is resting and waiting for the next trigger before it rages ahead. All eyes are on the Budget which is expected to spring some surprises.